FO: Crocus Socks | Stitch, Brinn, Stitch! Mods: Well, they’re shorter but other than that, none. So I really like these. I know I say that about a lot of the things that I knit, but I really do. 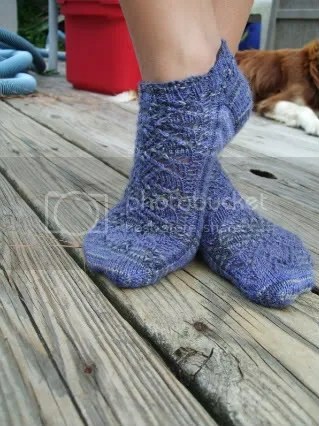 The pattern is great, the yarn is… serviceable, and the socks are comfortable and pretty. 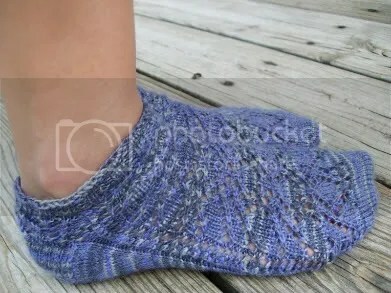 I followed the pattern more or less exactly, complete with flap/gusset heel. Except when worked toe-up, there’s no actual…flap. I don’t know if Wendy Johnson invented the toe-up flap heel herself, but it really is ingenious. It looks just like a flap heel worked from the top down. I’ll definitely keep the heel in mind for future socks. Speaking of future socks, I’ve started a new pair. 3×1 ribbed, toe-up, two at a time with Cascade Sassy Stripes. Probably will do the gusset/flap heel again so I can really see how it works (so I can adjust it for different stitch counts). But more on that later.